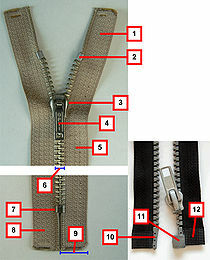 For other uses, see Zipper (disambiguation). "Zipping" redirects here. For the racehorse, see Zipping (horse). 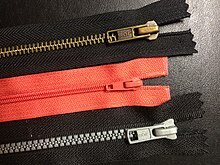 A zipper, zip, fly, or zip fastener, formerly known as a clasp locker, is a commonly used device for binding the edges of an opening of fabric or other flexible material, such as on a garment or a bag. It is used in clothing (e.g., jackets and jeans), luggage and other bags, sporting goods, camping gear (e.g. tents and sleeping bags), and other items. Zippers come in all different sizes, shapes, and colors. Whitcomb L. Judson, who was an American inventor from Chicago, is sometimes given credit as the inventor of the zipper, but he never made a practical device. The method, still in use today, is based on interlocking teeth. Initially, it was titled the “hookless fastener” and was later redesigned to become more reliable. In many jackets and similar garments, the opening is closed completely when the slider is at the top end. Some jackets have double-separating zippers with two sliders on the tape. When the sliders are on opposite ends of the tape then the jacket is closed. If the lower slider is raised then the bottom part of the jacket may be opened to allow more comfortable sitting or bicycling. When both sliders are lowered then the zipper may be totally separated. Bags, suitcases and other pieces of luggage also often feature two sliders on the tape: the part of the zipper between them is unfastened. When the two sliders are located next to each other, which can be at any point along the tape, the zipper is fully closed. attach or detach a small pouch or bag to or from a larger one. One example of this is military rucksacks which have smaller pouches or bags attached on the sides using one or two zippers. A zipper costs relatively little, but if it fails, the garment may be unusable until the zipper is repaired or replaced—which can be quite difficult and expensive. Problems often lie with the zipper slider; when it becomes worn it does not properly align and join the alternating teeth. With separating zippers, the insertion pin may tear loose from the tape; the tape may even disintegrate from use. If a zipper fails, it can either jam (i.e. get stuck) or partially break off. In 1851, Elias Howe received a patent for an "Automatic, Continuous Clothing Closure". He did not try seriously to market it, missing recognition he might otherwise have received. Howe's device was more like an elaborate drawstring than a true slide fastener. Forty-two years later, in 1893 Whitcomb Judson, who invented a pneumatic street railway, marketed a "Clasp Locker". The device served as a (more complicated) hook-and-eye shoe fastener. With the support of businessman Colonel Lewis Walker, Judson launched the Universal Fastener Company to manufacture the new device. The clasp locker had its public debut at the 1893 Chicago World's Fair and met with little commercial success. Judson is sometimes given credit as the inventor of the zipper, but he never made a practical device. The Universal Fastener Company moved to Hoboken, New Jersey, in 1901, reorganized as the Fastener Manufacturing and Machine Company. Gideon Sundback, a Swedish-American electrical engineer, was hired to work for the company in 1906. Good technical skills and a marriage to the plant-manager's daughter Elvira Aronson led Sundback to the position of head designer. The company moved to Meadville, Pennsylvania, where it operated for most of the 20th century under the name Talon, Inc. Sundback worked on improving the fastener and in 1909 he registered a patent in Germany. The US-rights to this invention were on the name of the Meadville company (operating as the Hookless Fastener Co.), but Sundback retained non-U.S. rights and used these to set up in subsequent years Lightning Fastner Co. in St. Catharines, Ontario. Sundback's work with this firm has led to the common misperception that he was Canadian and that the zipper originated in that country. Gideon Sundback increased the number of fastening elements from four per inch (about one every 6.4 mm) to ten or eleven (around every 2.5 mm), introduced two facing rows of teeth that pulled into a single piece by the slider, and increased the opening for the teeth guided by the slider. The patent for the "Separable Fastener" was issued in 1917. Gideon Sundback also created the manufacturing machine for the new device. The "S-L" or "scrapless" machine took a special Y-shaped wire and cut scoops from it, then punched the scoop dimple and nib, and clamped each scoop on a cloth tape to produce a continuous zipper chain. Within the first year of operation, Sundback's machinery was producing a few hundred feet (around 100 meters) of fastener per day. In March of the same year, Mathieu Burri, a Swiss inventor, improved the design by adding a lock-in system attached to the last teeth, but his version never got into production due to conflicting patents. In 1923 during a trip to Europe Sundback sold his European rights to Martin Othmar Winterhalter who improved the design by using ribs and grooves instead of Sundback's joints and jaws and started producing with his Riri-company on large scale first in Germany, then in Switzerland. The most recent innovation in the zipper's design was the introduction of models that could open on both ends, as on jackets. Today the zipper is by far the most widespread fastener, and is used on clothing, luggage, leather goods, and various other objects. Reverse coil zippers are a variation of the coil zipper. In a reverse coil zipper, the coil is on the reverse (back) side of the zipper and the slider works on the flat side of the zipper (normally the back, now the front). Unlike an invisible zipper where the coil is also on the back, the reverse coil shows stitching on the front side and the slider accommodates a variety of pulls (the invisible zipper requires a small, tear-drop pull due to the small slider attachment). Water resistant zippers are generally configured as reverse coil so that the pvc coating can cover the stitching. A rubber or PVC coated reverse zipper is called a waterproof zipper. Metal zippers are the classic zipper type, found mostly in jeans and pencil cases today. The teeth are not a coil, but are individual pieces of metal molded into shape and set on the zipper tape at regular intervals. Metal zippers are made in brass, aluminum and nickel, according to the metal used for teeth making. All these zippers are basically made from flat wire. A special type of metal zipper is made from pre-formed wire, usually brass but sometimes other metals too. Only a few companies in the world have the technology. This type of pre-formed metal zippers is mainly used in high grade jeans-wear, work-wear, etc., where high strength is required and zippers need to withstand tough washing. Plastic-molded zippers are identical to metallic zippers, except that the teeth are plastic instead of metal. Metal zippers can be painted to match the surrounding fabric; plastic zippers can be made in any color of plastic. Plastic zippers mostly use polyacetal resin, though other thermoplastic polymers are used as well, such as polyethylene. Used most popularly for pencil cases, small plastic pouches and other useful stationery. Two way open-ended zippers Instead of having an insertion pin and pin box at the bottom, a two way open-ended zipper has a puller on each end of the zipper tape. Someone wearing a garment with this kind of zipper can slide up the bottom puller to accommodate more leg movement without stressing the pin and box of a one-way open-ended zipper. It is most commonly used on long coats. Magnetic zippers allow for one-handed closure and are used in sportswear. Waterproof zipper on a diving dry suit. The exterior metal segments clamp the waterproof sheeting over the concealed zipper teeth. The zipper teeth are not visible in this image (obscured by the edges of the waterproof sheet). This double-mated surface is good at retaining both vacuum and pressure, but the fit must be very tight, to press the surfaces together firmly. Consequently, these zippers are typically very stiff when zipped shut and have minimal flex or stretch. They are hard to open and close because the zipper anvil must bend apart teeth that are being held under tension. They can also be derailed (and damage the sealing surfaces) if the teeth are misaligned while straining to pull the zipper shut. A less common water-resistant zipper is similar in construction to a standard toothed zipper, but includes a molded plastic ridge seal similar to the mating surfaces on a ziploc bag. Such a zipper is easier to open and close than a clipped version, and the slider has a gap above the zipper teeth for separating the ridge seal. This seal is structurally weak against internal pressure, and can be separated by pressure within the sealed container pushing outward on the ridges, which simply flex and spread apart, potentially allowing air or liquid entry through the spread-open ridges. Ridge-sealed zippers are sometimes used on lower-cost surface dry suits. The zipper handle can have a short protruding pin stamped into it, which inserts between the zipper teeth through a hole on the slider, when the handle is folded down flat against the zipper teeth. This appears on some brands of trousers. The handle of the fly zipper is folded flat against the teeth when it is not in use, and the handle is held down by both slider hinge tension and the fabric flap over the fly. The slider can also have a two-piece hinge assembly attaching the handle to the slider, with the base of the hinge under spring tension and with protruding pins on the bottom that insert between the zipper teeth. To move the zipper, the handle is pulled outward against spring tension, lifting the pins out from between the teeth as the slider moves. When the handle is released the pins automatically engage between the zipper teeth again. They are called "auto-lock sliders". Different types of zipper pullers and sliders. Forbes reported in 2003 that although the zipper market in the 1960s was dominated by Talon Zipper (USA) and Optilon (Germany), Japanese manufacturer YKK grew to become the industry giant by the 1980s. YKK held 45 percent of world market share, followed by Optilon (8 percent) and Talon Zipper (7 percent). In Europe, Cremalleras Rubi company established in 1926 in Spain, continues to compete with the big multinationals selling over 30 million zippers in 2012. In 2005, The Guardian reported that China had 80 percent of the international market. Most of its product is made in Qiaotou, Yongjia County. The locking members are all alike, and therefore interchangeable, and in general form consist of contractible jaw portions which are clamped upon the tape and projecting locking portions of elongated cup shape, so that the outside of one member nests within the recess of an adjoining member when in locked relation. Consequently, it will be seen that the members on one stringer alternate with those on the other, so that when the sliding operating device is moved back and forth, the locking members will be engaged and disengaged according to the direction of movement. A further feature of the invention resides in the shape and configuration of the locking members ... [they are] provided with exterior and interior rounded surfaces, and are somewhat elongated transversely. Thereby, a snug fit is obtained and at the same time ample provision is given for movement of one on the other without coming out when the fastener is flexed transversely. At the same time this construction gives facility for relative longitudinal movement, without disengagement. The zipper is analogous in function to a drawstring, but different in mechanism. A draw string works by tension in the string drawing together the eyelets of the piece together because the tension acts to straighten the string and so forces the eyelets toward a line. The zipper works by an elastic, that is, reversible, deformation of the "locking members" (teeth). The zipper teeth are shaped and sized so that the forces which act on the zipper when the garment it is sewn on is worn cannot unlock the teeth. The slider constrains the teeth positions, moves them along a given path, and acts on the teeth one-by-one in its "Y-shaped channel" and so can reversibly lock and unlock them. This is a lock and key design. In Sundback's invention the teeth are symmetric with "exterior and interior rounded surfaces" that are "elongated transversely". The teeth have a material part ("external projection") and a space ("internal recess"). The material part of one tooth is slightly smaller than the space on the other and so shaped to act as a "contractible jaw"--the jaw is elastically opened and then closed as it goes over the other tooth. The "snug fit" that results when "one member nests within the recess of an adjoining member" is a stable locked state. The maximum force when the slider operates is in between the unlocked and locked positions, giving two stable mechanical equilibria. The "snug fit" is stable not only to forces from wear that act in the same direction as those of the slider but to transverse and longitudinal (both perpendicular) forces. The zipper is analogous in mechanism to a bobby pin, where the person's hand slides hair into and out of the pin's "contractible jaw". Zippers have entered into urban legends. American folklorist Jan Brunvand noted that "The zipper has been the subject of jokes and legends since... the 1920s". Those stories reflect "modern anxieties and desires", emphasizing embarrassments and accidents, primarily involving the flies of men's trousers in stories such as "The Unzipped Stranger" and "The Unzipped Fly". 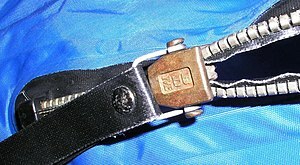 The zipper is often the least durable component in any garment or type of equipment. Most often the zipper fails to close due to a worn or bent slider not being able to apply the necessary force to the sides of the teeth to cause them to interlock. This problem can sometimes be redressed by using small pliers to carefully squeeze the back part of the slider together a fraction of a millimeter. This can compensate for the wear of the slider. The slider is typically made as a magnesium diecast which breaks easily. It is necessary to reduce the force on the pliers before it can be felt that the slider actually gives in. If it is not yet possible to successfully close the zipper, the pressure applied to the slider should only gradually be increased. Another way to reduce the gap of the open end of the slider is by preparing a small block of wood by sawing a slot into one end so that it fits over the upper arm of the slider. Then a hammer can be used to exact a force onto the slider by carefully hitting the wood. When the protective coating of the diecast slider has been worn off by prolonged usage, the material can corrode. The corrosion products are usually metal salts which can accumulate and block the slider from moving. When this happens the salt can often be dissolved by submerging the slider in vinegar or another mild acid. Otherwise the slider needs to be removed and replaced. ^ Friedel, Robert (1994). Zipper: An Exploration in Novelty. United States of America: Horton. ^ "YKK Fastening Products Group". Ykkfastening.com. Archived from the original on 17 June 2010. Retrieved 14 July 2011. ^ a b c "Zipper History". AnsunMultitech. Archived from the original on 8 July 2012. Retrieved 22 June 2012. ^ SUNDBACK GIDEON [US]. "Bibliographic data: DE216807 (C) ― 1909-12-04: Verschluss fuer Kleidungsstuecke jeder Art und fuer Gebrauchsgegenstaende, Bestehend aus an den Verschlusskanten des Kleidungsstueckes o.dgl. kettenartig angeordneten Oesen und Hakengliedern". Espace net Patent search (European Patent Office). ^ Friedel, Robert (1996). Zipper: An Exploration in Novelty. W. W. Norton & Company. p. 94. ISBN 978-0-393-31365-9. ^ Göldi, Wolfgang (2013). Historisches Lexikon der Schweiz, vol 12. Basel: Schwabe AG, Basel. pp. Winterhalter, Martin. ISBN 978-3-7965-1912-3. ^ Arbenz, Arnouk. "Irrsinniges Genie". Unternehmerzeitung. Retrieved 29 August 2018. ^ Cooper, Wilbert (8 March 2013). "THE FIRST WILD ONE: THE GENESIS OF THE MOTORCYCLE JACKET". vice.com. Retrieved 16 September 2014. ^ Mary Bellis (16 June 2010). "History of the zipper". About.com Inventors. Retrieved 14 July 2011. ^ Liszewski, Andrew (16 October 2013). "I Have Seen the Future and It's a One-Handed Magnetic Zipper". Gizmodo. Retrieved 17 October 2013. ^ MacGill, Sally (2010). Ideas That Changed the World. New York: Dorling Kindersley Limited. ^ Drysuits: Zippers, Seals, Valves and Maintenance Archived 29 August 2011 at the Wayback Machine, NJScuba.net. Illustrated dissection of a dry-suit zipper. ^ "Zipper Parts". ZipperSource. Zippersource. Retrieved 27 September 2013. ^ Benjamin Fulford (24 November 2003). "Zipping Up the World". Forbes.com. Retrieved 24 April 2012. ^ Jonathan Watts (25 May 2005). "The tiger's teeth". The Guardian. Retrieved 24 April 2012. ^ Ikenson, Ben. Patents: Ingenious Inventions : How They Work and How They Came to Be. New York: Black Dog & Leventhal Publishers, 2004. ^ Kevin J. McKenna (2009). The Proverbial "Pied Piper": A Festschrift Volume of Essays in Honor of Wolfgang Mieder on the Occasion of His Sixty-fifth Birthday. Peter Lang. pp. 31–. ISBN 978-1-4331-0489-3. Petroski, Henry (1992). The Evolution of Useful Things. New York: Alfred A. Knopf. ISBN 0-679-74039-2. Friedel, Robert (1996). Zipper: An Exploration in Novelty. New York: W. W. Norton and Company. ISBN 0-393-31365-4. Wikimedia Commons has media related to Zippers. This page was last edited on 15 April 2019, at 13:29 (UTC).